Clover Wray peacefully joined her brothers Mulligan and Chip on May 30, 2014. 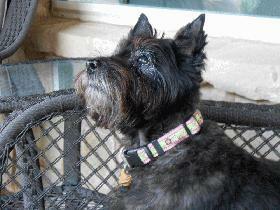 She was a stoic and loyal little Cairn. Favorite food: I love all food. Favorite toy: Anything that either Chip or Mulli is playing with. Favorite activity: I love to chase anything that moves especially squirrels and butterflies. Special talents: Hummm, not sure if not being able to bark is a talent or something that was done to me by the puppy millers. Most embarrassing moment: When my Mom stepped in my poop with her bare feet. Most trouble I ever got into: When Chip and I had a major fight and my Mom got on to me real bad. That was the last fight we have had. My favorite friends: Chip and Mulligan of course. Biggest adventure: The first week I was here we evacuated for Hurricane Dennis. Then we stayed home for Hurricane Katrina. We hate having to go potty during one of those things.